The annual charitable Food Bank campaign was held on November 24th-25th. 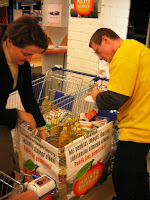 Hope Worldwide Vilnius was designated one supermarket where we had leaflets to give out to the customers & invite them to buy & donate food for our needy seniors. The campaign was really successful for us this year: in terms of both number of volunteers attracted & favorable customers’ response to our call for support in the form of food raised & positive reaction. Totally 31 volunteer participated with us. Majority were from a local Christian community & the seniors themselves, but also some others (e.g., volunteers from Big Brother Big Sister program). In all we raised food worth 1.300 Euros (last year it was 1 100 Euros). The food is going to be distributed in the form of food hand-outs to our seniors of the Old Friends' Home as well as some other needy persons.